Too cool to be comfy? It’s no road hog, but it will get you there and make you the talk of the campground. Called the Basecamp,® this retro styled pull-behind is the progeny of Airstream, Nissan Design America and outdoor outfitter Kelty. The concept was to design and produce a lightweight, multi-purpose, tent-trailer hybrid that takes the company’s trademark blimp-like design to a new, ultra-sleek look. The new design was inspired by the original “Torpedo” developed by Airstream Trailer Co. founder Wally Bryan in the 1930s. Bryan took cues from aircraft aerodynamics and incorporated the rivet on polished aluminum construction that became Airstream’s trademark. The Basecamp is sleek, stylish, and surprisingly roomy. Kelty’s contribution is an optional attachable tent that doubles the living space. Optional cargo floor tracks let you load up your ATV or Harley and head for the great outdoors. Other add ons include a toilet, Butane cooktop, refrigerator/freezer, skylight and air conditioning. 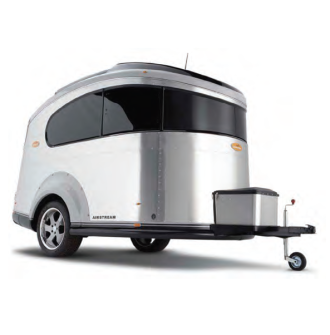 Fully equipped, the Basecamp hovers in the $27,000 range. The base model starts at $22,995. Remember when mom and dad packed the Oldsmobile for a trip? They loaded up a big box of travel essentials, books, travel-size checkers, crayons, and coloring books. Snacks were limited to Tupperware filled with Cheerios and Fruit Loops and maybe a PB&J on white bread with the crust trimmed. Things are so much better today—I suppose— with DVD players built into the headrests and portable Gameboys that plug into the cigarette lighter for power. However, if you yearn for simpler pleasures get on the Internet and go to 52WEEKENDS.COM, then click your way over to the JR. NAVIGATOR pages. The website is sponsored by Airstream, Inc. and features some very cool travel games that you can download for free. Everything from a ready-to-make Road Journal to Travel Bingo cards (for both desert and nondesert destinations) and a scorecard for the venerable “Car Count” game.